Join the editors and two narrators of Solito, Solita for a discussion of this powerful new book from Voice of Witness and Haymarket Books. 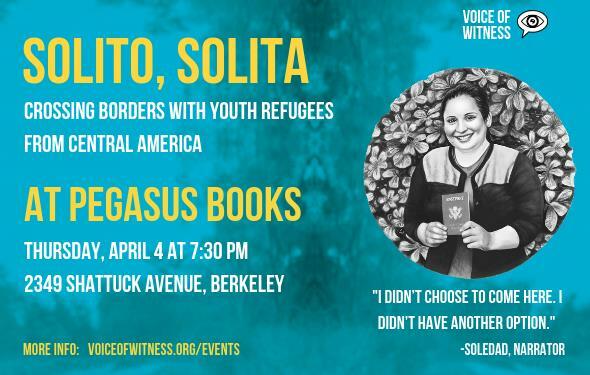 Solito, Solita tells the stories of youth refugees fleeing their home countries and traveling for hundreds of miles seeking safety and protection in the United States. In an era of fear, xenophobia, and outright lies, these stories amplify the compelling voices of immigrant youth. What can they teach us about abuse and abandonment, bravery and resilience, hypocrisy and hope? Gabriel, who after surviving sexual abuse starting at the age of eight fled to the United States, and through study, legal support and work, is now attending UC Berkeley. Soledad, a young woman from Honduras who fled at age 14 after being abused by her stepfather, abandoned by her mother, and forced into child labor. She recently graduated from SFSU. Jonathan Freedman is a Pulitzer Prize–winning journalist, author, and writing mentor at the City College of San Francisco.